Electrical engineers all over the world would bet anything for a better datasheet search engine. Its such an under served Â market that there are still rooms for improvement. Although there are hundreds of websites which supplies datasheets in the form of PDF like DatasheetCatalogue, AllDataSheet and many others, recently launched DatasheetLib follows a different approach from the existing players. In this article my aim is to compare different datasheet providing websites and see how they all are different from each other. Let’s just begin by comparing the home page of above 3 datasheet providers. Our aim is to find which home page has a better user interface and better navigation. AllDataSheet – has a filled up home page with maximum datasheet links placed. They give importance to newly added datasheets in their website. They project these newly added datasheets with much importance in their home page. 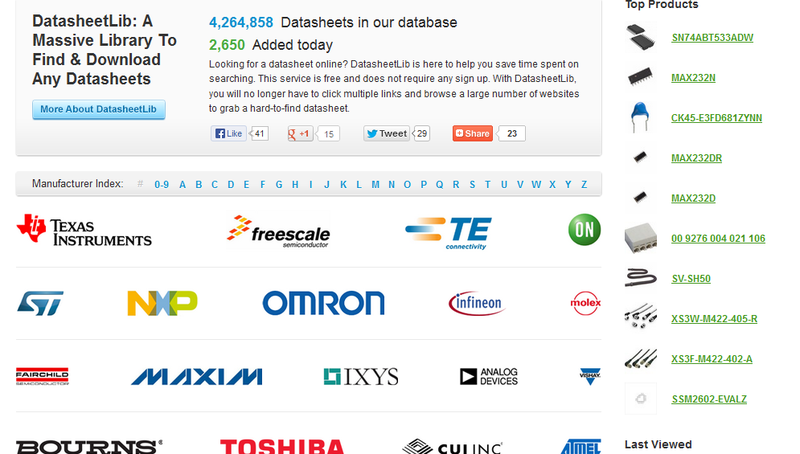 Out of the 3 websites, AllDataSheet has the worst user interface as its too much confusing. But they have provided extra search filters, which will help people identify a part without much hassle. DatasheetCatalogue – gives importance to placing quick links to most frequently used components. This approach is better than the way AllDataSheet presents their home page. AllDataSheet lists newly added components in their home page, which may not be pleasing to every one. The average guy might be looking to access a datasheet quickly from the home page. What other way better than providing the “most frequently used” datasheets in the home page itself. Â However DataSheetCatalogue missed the game by not listing links to access brands/manufacturing companies quickly from home page. DataSheetLib – wins the game with a good user interface among the 3 datasheet database websites. They have presented the home page with better contents. They list the datasheets in most demand under their top products label. In addition they have provided index based access links to all manufacturers, which is the quickest way to search a datasheet. We all search for a component by having the information about manufacturer in hand. By providing an index based access to all manufacturers, these guys have solved a pain point for many engineers. Finally they have an auto suggestion feature on their search engine (provided in home page and other inner ages). Auto suggestion is really a useful feature when we search for a particular component among thousands of other components with almost similar names. When it comes to the size of database, AllDataSheet wins the game. They provide over 20 million datasheets in their websites and they maintain this huge database and the huge bandwidth by using mirror sites. They also have setup different mirror sites for different languages as well. DataSheetLib has around 4 million datasheets in their library and they are updating their database daily with new datasheets. Lets analyze the inner pages of these 3 websites by accessing the datasheet of MAX232Dr IC. Let’s see which website wins the game by presenting the datasheet and all important specifications in a way that is useful for users. Max232 in DataSheetLib – presents all important technical specifications in tabular form. No other website provides this much important technical specifications in tables. This approach helps the user to access information quickly and saves his precious time by avoiding the need to download a datasheet. AllDataSheet-Max232 and DataSheetCatalogue-Max232 pages just provides information about the PDF file in general like its number of pages & size. In both website user have to either download the PDF or view it online and skim through the PDF to access different technical specifications. This makes DataSheetLib a true winner in creating a useful user interface (by presenting important data in tables) for inner pages as well. We hope it was a fair review of 3 prominent websites providing datasheets. Let us know in comments if there is a website that you wish to add in this list or a website which is better than the above 3 datasheet websites. datasheetlib is not good one even Google is not properly searching it I searched basic IC.I couldn’t found.Datasheecatalog is best one,easy to search and download.